LA based @justkissa's journey of being a woman entrepreneur. She shares her advice, ups and downs of her business journey, and life lessons along the way. I this episode I recap on my week and give you advice about using pop up events to grow your business. I share the benefits, some advice, and strategy on how to make it a successful one. I know it's been a while! I've missed my TEL fam but it's good to be back! Today I'm sharing my first phase of my Goal Setting series - my first 3 steps on how I prepare for my goals and my wants for the next year. In this episode of The Entrepreneur Life Podcast I recap the last 2 weeks of the journey. Celebrating Ninong's 10 Years of business, working on analysis paralysis, a little about 2019, and goals for the upcoming week. 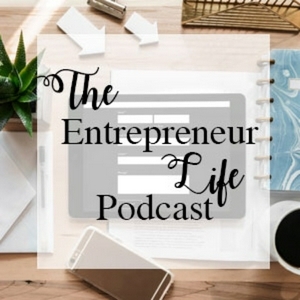 In this episode of the Entrepreneur Life Podcast I have guest HeatherJustCreate on the show as we set goals for October, talk about financial woes, and online sales strategies. In this episode I talk about the loss of our pup Baxter and how my little family is dealing with it. I also talk about this past Saturday, customer complaints, and how to bounce back. In this week's episode I'm catching you up on this past short week. If you have any productivity app suggestions please send them my way! Let's talk about money being tight, dealing with criticism, and valuing time with your loved ones. In this episode of The Entrepreneur Life Podcast I catch you up on the last 2 weeks and how crazy it's been! Working hard to be able to rest, a few observations about other entrepreneurs and how they think a successful business is achieved, and the usual goals and key takeaways for this week. This week we're talking about stats and optimization, employee management, and mindset. In this episode I talk about my week, key takeaways, and life lessons. Knowing your worth, my little experience with Instagram and Facebook ads, and honing in on my brand. I’ve been on a hiatus with this podcast cuz i couldn’t figure out where I was going with it. But it dawned on me today, and I’m excited to get started again. In this episode we discuss the inevitability of doubters and how important it is to believe in yourself or else no one else will. In this episode I talk about how I had a mini melt down and how it’s ok to rest. In this episode of the Entrepreneur Life Podcast I share my tips on making a lasting impression on social media. Ep 4: What’s a Marketing Plan? In this episode of The Entrepreneur Life Podcast, we talk about the different parts of a marketing plan and what goes into it. In Episode 2 of the Entrepreneur Life Podcast I share the importance of planning and various reasons why startups fail according to Forbes magazine. Thinking about starting a business? That’s great! Here’s my main pieces of advice when thinking about starting a business. I'm back from traveling the past 2 weeks! I didn't work at all while I was away.